The Prosecutor of the International Criminal Court has announced that her office is making important changes in its approach to investigations. She spoke about the change in remarks delivered at the Free University of Brussels on Thursday on the occasion of an award to her of an honorary doctorate. Prosecutor Bensouda said that a document explaining the changes is about to be posted on the website of the Office of the Prosecutor. There was a strong sense in her remarks that the current approach to investigations, developed by her predecessor Luis Moreno-Ocampo, had not delivered the sort of results that were expected. More than once she referred to the fact that the judges had set higher standards and expectations about the amount and quality of evidence than the Office was in a position to provide at various stages in the proceedings. She said that the Office of the Prosecutor plans to move away from the ‘focussed investigations’ that were the hallmark of the first nine years of activity. For example, in the Lubanga prosecution the scope of the prosecution was ‘focussed’ on the child soldier offences whereas, she indicated, many other charges might have been considered but were not. In the future, she said that more alternatives would be considered at early stages in the investigations. Prosecutor Bensouda said that future investigations might not be directed at those ‘most responsible’ for atrocities in a given situation. Rather, the Office might try to start at the base, and build up. This is an approach reminiscent of that developed by Richard Goldstone when he was Prosecutor of the International Criminal Tribunal for the former Yugoslavia in the mid-1990s. She also said that there would be a move away from the very heavy reliance upon eye witness testimony. The Prosecutor said that rather than prepare investigations in stages, depending upon the procedural requirements of the Statute, the Office will now endeavour to have its cases as close to trial ready as possible as early as possible. This has been a source of frequent criticism from judges of the Court. This report is based upon notes taken during her remarks. Probably the document setting out the new approach will complete our understanding of what the Office proposes to do. The new prosecutorial approach is a welcome development. At the very least, there is a recognition that something within the Office has failed and needs to be changed. What remains to be seen is whether these changes will be effective and whether they will be adequate. In particular, the difficulties of the Office of the Prosecutor, and of the Court more generally, may well go beyond the approach to investigations. In her remarks in Brussels on Thursday, the Prosecutor did really address what may be a far more important source of difficulty for the Court, namely its relationship with the African Union, African States more generally and the political forces that are at work there and elsewhere. On this point, she said only that she would ‘not consider broader matters concerning peace and security’ and that she would ‘respect the mandates of others’. As always, she presented her views in a modest and accessible manner. Her personal style is a sharp contrast with the hectoring, arrogant and very over-confident manner of the previous Prosecutor. The ruling of the Appeals Chamber on the issue of presence at trial by the Vice-President of Kenya (and, by implication, the President) was delivered Friday. The Appeals Chamber confirms the reading of article 63 as permitting absence from trial. The wording appears to be peremptory and absolute. The Prosecutor had argued that the only exception was that provided in the Statute concerning removal of a disruptive accused. The argument for the strict and literal construction of article 63 relies in part on the observation that it is not there to protect the right of the accused to be present, something that is already found in article 67 dealing with the rights of the accused. The fact that there are two provisions dealing with presence at trial certainly raises a problem of interpretation. Bismarck once said that if you love laws and sausages it is better not to see how they are made. His observation is probably applicable to the Rome Statute. It is difficult to discern any profound purpose in the decision of the drafters to specify presence at trial in two places and not one. According to the Appeals Chamber in the recent ruling, ‘part of the rationale for including article 63 (1) of the Statute was to reinforce the right of the accused to be present at his or her trial and, in particular, to preclude any interpretation of article 67 (1) (d) of the Statute that would allow for a finding that the accused had implicitly waived his or her right to be present by absconding or failing to appear for trial’. The more flexible view adopted by the Appeals Chamber that presence at trial is a right to be exercised by the accused that can be waived is surely the correct one. In the Trial Chamber, much attention was devoted to the application of article 27. A quite imaginative suggestion was advanced that the prohibition of the defence of official capacity meant that it was improper to take into consider the special functions of Vice-President Ruto in applying article 63. The Appeals Chamber ignores this point entirely. After acknowledging that the Trial Chamber has discretion to excuse the accused from presence at trial, the Appeals Chamber goes on to find that the discretion of the Trial Chamber was not exercised properly. This is the unconvincing part of the judgment. It seems as if we leave the legal environment, where the Appeals Chamber reaches conclusions based upon interpretation of the text in light of the drafting history and the case law, and move onto the terrain of the individual opinions of its members. The Appeals Chamber doesn’t agree with the way the Trial Chamber used its discretion. It sets out a number of criteria for applying article 63. Where these come from is a mystery. Confronted with such a problem, the late Antonio Cassese would have canvassed the sources of applicable law in order to see if rules and guidelines could be derived from, for example, ‘general principles of law’ found in national court decisions. But here the Appeals Chamber does nothing of the sort. The final portion of the judgment in which it develops the standards for applying article 63 is exceedingly brief and does not seem to be rooted in any recognised sources of law. I suppose the Appeals Chamber devised the criteria to be applied in its wisdom, based upon ‘common sense’. But then so, presumably, did the Trial Chamber. That’s the whole point of discretion. If legislation leaves a judge with discretion, then the exercise of that discretion should be respected absent evidence that it has been exercised in a grossly abusive manner or for improper motives, which has never been suggested in this case. It is probably not helpful to the proper administration of justice for the Appeals Chamber to intervene with the Trial Chamber merely because in its view the latter ‘interpreted the scope of its discretion too broadly and thereby exceeded the limits of its discretionary power’, as the Appeals Chamber says. As things stand right now, we simply have a disagreement amongst judges about the use of discretion. Why should that be a matter for appeal? Yesterday the Belfast Guidelines on Amnesty andAccountability were released. They are the product of a series of expert meetings convened by Louise Mallinder and Tom Hadden at the University of Ulster. The document represents a consensus of the experts who participated. Versions of the Guidelines are available in the six official languages of the United Nations. 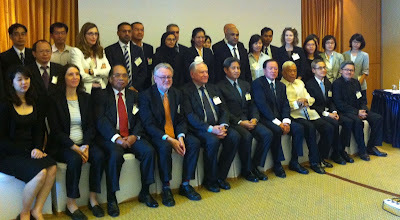 Participants in the Bangkok conference. 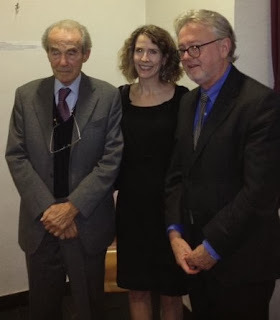 Robert Badinter, Sandra Babcock and myself in Paris last week. Sandra Babcock's blog on the meeting. Last week, I was at a fascinating meeting in Paris on capital punishment, held at the École normale supérieure. It was an intersection of philosophy and law, with much discussion of the recent book of lectures by Jacques Derrida on the death penalty, published posthumously. The Grand Chamber of the European Court of Human Rights has dismissed an application by the families of victims of the Katyn massacre based upon an evolving theory concerning the temporal application of the European Convention: Janowiec and Others v. Russia. For a comment and critique of the decision, see the statement by the European HumanRights Advocacy Centre, which had intervened in the case. There is also a very vigorous dissenting judgment by several members of the Court. The applicants had previously been partially successful before a seven-judge Chamber of the Court. One of the ironies of this case is that it was the applicants who took the issue to the Grand Chamber where they in effect had a setback from their achievements in the Chamber. The core issue was whether the so-called ‘procedural obligation’ upon States to investigate violations of the right to life, something that is now well-established in the European Court’s case law, can apply to events prior to entry into force of the Convention for a particular State. In Russia's case, the operative date is 1996. The Katyn massacre took place in 1940. Until recently, the Court had confined the scope of this procedural obligation to violations of the right to life occurring since entry into force of the European Convention. The Katyn application attempted to take it further into the past, basing itself on the very important humanitarian grounds justifying a full and proper inquiry into the massacre. The judgment discusses the history, noting that the killings on the orders of the Soviet leaders in 1940 were subsequently uncovered by the Nazis. The Soviets denied responsibility and even insisted that the Nazi defendants be prosecuted for the crime at Nuremberg, although as yesterday’s judgment notes the final ruling at Nuremberg, including the Soviet judge’s separate opinion, was silent on the question. Much later, Russia admitted responsibility. Yet apparently important records concerning the massacre remain inaccessible on the grounds of ‘national security’. The European Court had the chance to heal a wound in Europe’s legal history that had been left open by the Nuremberg judgment. Alas, it has missed the chance. Moreover, it seems to have closed the door on scrutiny of the atrocities of the past. Some will think this is prudent because of the unforeseen consequences of opening what might amount to a Pandora’s box. Yet progress in human rights within Europe, and the important role that European human rights law plays as a model on a global scale, cannot rest on amnesia about dark episodes in the continent’s history.